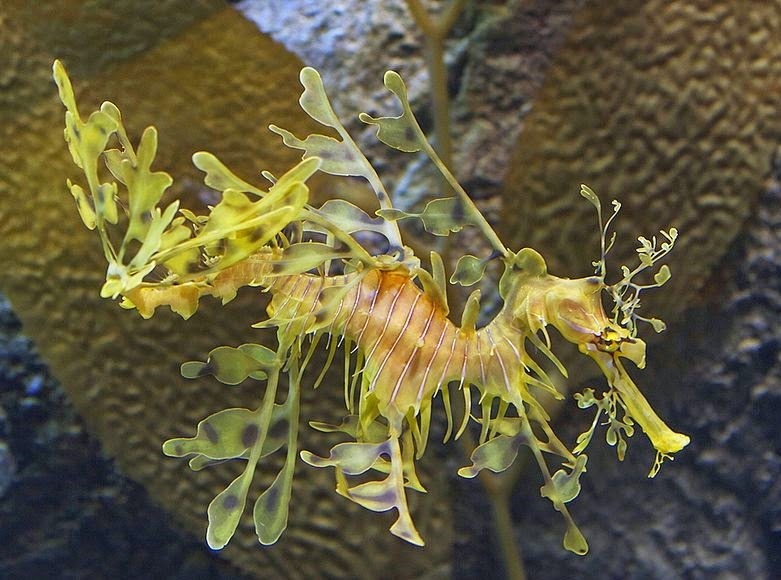 Meet the leafy seadragon, a marine fish of the family Syngnathidae, which also includes seahorses. It is the sole representative of the genus Phycodurus. 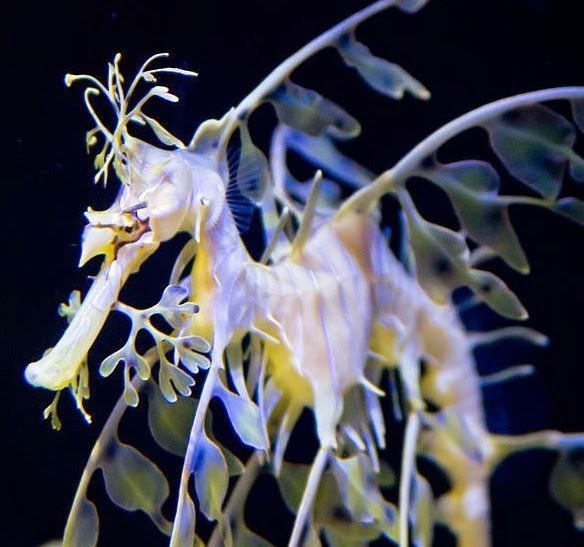 The leafy seadragon's name is derived from its resemblance to a mythical dragon covered with long, leaf-like protrusions. 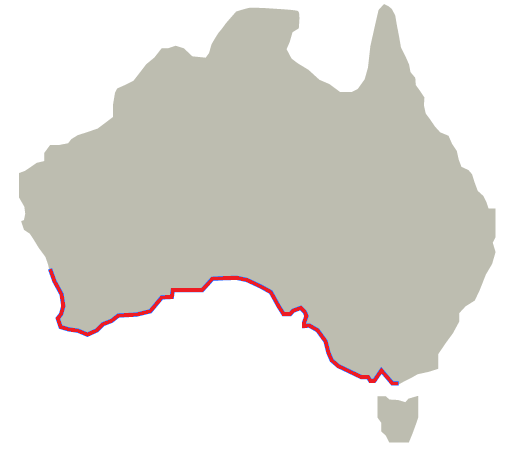 The species occurs exclusively in the southern Australian waters, from Wilson’s Promontory in Victoria at the eastern end of its range, westward to Jurien Bay, 220 km (136 miles) north of Perth in Western Australia. In the past, individuals were believed to have very limited ranges, however, further research has shown that leafy sea dragons can travel several hundred meters from their habitual locations, returning to the same spot using a strong sense of direction. The species prefers sand patches in waters up to 50 m (~ 164 ft) deep, around kelp-covered rocks and clumps of sea grass. 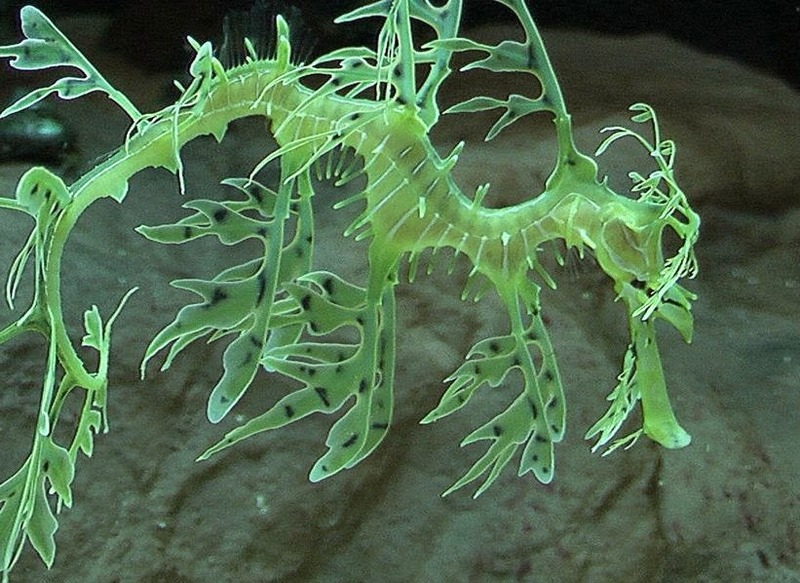 Leafy seadragons are commonly sighted by scuba divers near Adelaide in South Australia, especially at Rapid Bay, Edithburgh, and Victor Harbor. As suggested by its common name, P. eques looks like a miniature dragon covered with long, leaf-like protrusions. Slightly larger than most seahorses, adults grow to be about 20 - 30 cm (~ 8 - 11 in) long. 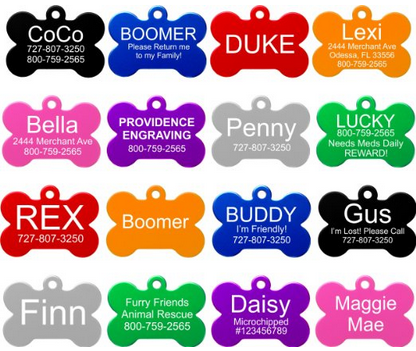 They are yellowish-brown to green in color, depending on age, diet and location. The leaf-like protrusions serve only as camouflage and have no other uses, e.g. in propulsion. They are lobes of skin and give P. eques the appearance of seaweed. To propel itself, the leafy seadragon uses a pectoral fin on the ridge of its neck and a dorsal fin on its back, closer to the tail end. Both these fins are very small, almost completely transparent and difficult to see as they undulate minutely to move the creature sedately through the water. This complements the seaweed illusion even during swimming. 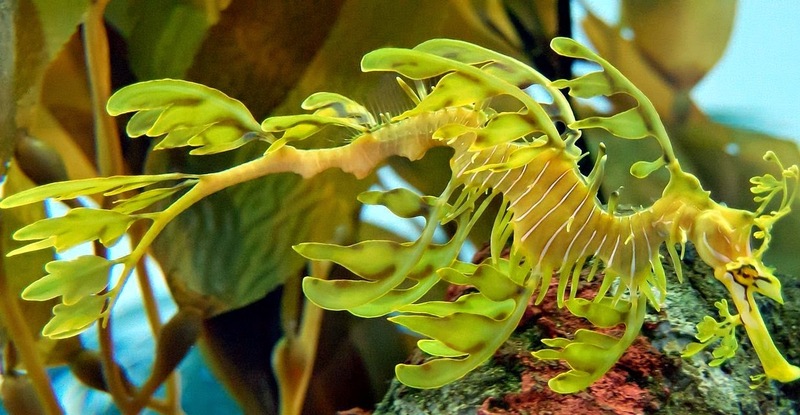 Interestingly, leafy sea dragons can also change their color to blend in, however this ability appears to depend on the seadragon's diet, age, location, and stress levels. The species uses the fins along the side of its head in order to to steer and turn. However, its outer skin is fairly rigid, limiting mobility. Some seadragons have been observed remaining in one location for extended periods of time (up to 68 hours), but will sometimes move for lengthy periods. The tracking of one individual indicates that they can move up to 150 m (~492 ft) per hour. Sexual maturity is reached at the age of two, when they are fully grown and ready to breed. These strange animals usually live a solitary lifestyle except during the breeding season when the male courts the female and the two pair up to breed. The breeding season runs from October to March, and during this period males develop a 'brood patch' on the underside of the tail that consists of cups of blood-rich tissue. The female produces up to 250, bright pink eggs. Similarly to seahorses, the male leafy seadragon incubates the eggs. The female deposits them onto the aforementioned brood patch (which supplies them with oxygen) with a long tube called ovipositor. Not all eggs are transferred, as the brood patch can hold around 120 of them. The eggs are then fertilized and carried by the male for about a month. Hatchlings begin to emerge over the course of several days. They are only about 2 cm long and extremely vulnerable to predation, with only about 5% of hatchlings reaching adulthood. Today, P. eques is listed by the IUCN as Near Threatened, with the main threats being habitat loss and degradation and incidental harvesting due commercial fishing. These two factors have greatly reduced the overall populations of the species. Aquarium harvest is an additional problem although with a minor impact on their numbers. Fortunately, many conservation efforts including diver education, research efforts, and habitat preservation are currently underway in Australia to protect the species from any further decline. The species is protected by law and thus getting one as a pet is very expensive and possibly illegal. Furthermore, leafy seadragons are difficult to maintain in an aquaria, with most success belonging to the public aquarium sector, due to funding, knowledge and resources that are typically not available to the average aquarist. Attempts to breed the species in captivity have so far been unsuccessful. Some aquariums in Australia exhibiting this beautiful creature include the Sydney Aquarium, the Melbourne Aquarium, and the Aquarium of Western Australia. In Canada, Ripley's Aquarium of Canada, Toronto displays the species along with the closely related weedy seadragon. Although closely related, the leafy sea dragon isn't a true sea horse. The two differ in appearance, form of locomotion, and the inability of seadragons to coil or grasp things with the tail. Furthermore, they do not have a pouch for rearing the young. As aforementioned, male seadragons carry the eggs fixed to the underside of the tail. - The leafy sea dragon is the marine emblem of the state of South Australia and a focus for local marine conservation. - The weedy seadragon (Phyllopteryx taeniolatus), is a closely related species that also grows weed-like fins, but is smaller in size.